The ongoing strike by the Academic Staff Union of Universities (ASUU) may likely be called off as a result of the recent breakthrough in negotiation with the Federal Government on some outstanding issues. 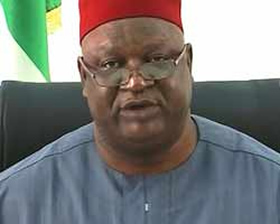 This is coming as the Secretary to Government of the Federation (SGF), Sen. Anyim Pius Anyim yesterday in Abuja inaugurated the “Universities Needs Implementation Committee”, with Governor of Benue State, Gabriel Suswam as its chairman. Suswam while speaking to journalists after the more than two hours meeting with ASUU representatives yesterday, disclosed that the two parties have resolved and agreed on all outstanding issues except two, which were the pending payment of allowances and upgrading of universities physical infrastructures. He said that the two outstanding issues would be addressed next week with SGF handling the pending incomes with ASUU on Monday, while the upgrading of the university infrastructures would be discussed with his committee together with other intervention agencies. He clarified that while it was not in his position to guarantee that the strike would be called off next week, but there was the likelihood of it, if the two remaining issues were resolved. “It is not in my position to say when the strike will be called off…If all the issues are resolved, what is the need of carrying on with the strike”, was his response when asked about the possibility of calling of the strike next week. Suswam listed some of the major issues agreed upon to include the retirement age of the university lecturers from 65 to 70 years; setting of research centres; establishment of pension Administration, and governing council (which has been done already) amongst others. “After so many hours of deliberation, we agreed on major issues except two of them, which are on the pending upgrading of physical infrastructures of the universities and pending allowances”, he said. He added that, “By Monday we will talk about the pending allowances, while on Thursday that of upgrading of the university facilities will be discussed with my committee together with other intervention agencies”. Speaking further he said: “The issue of government intervention in the universities…because if you look at many universities there are infrastructural deficit and that is why we will also involve intervention agencies, and foreign institutions”. “The other issues agreed upon are the retirement age from 65 to 70 years, it has been resolved; setting of research centres; establishment of Pension Administration, and Governing Council, which has been done already. Earlier, Anyim while inaugurating the Needs Assessment Committee, emphasised that it was set up in a bid to put in place appropriate requirements conducive for academics in all tertiary institutions in Nigeria. He said that the major needs of all Federal Universities were identified by an assessment committee earlier set up to “assess and prioritise the needs of universities”. He said: “The report submitted by the Needs assessment Committee mandates the inaugurated Committee to interface with all agencies providing funding support to the universities with the aim of appropriately channelling support to identified priorities. “Stimulate private sector investment into the public universities, monitor progress of the projects implementation and produce quarterly report for submission to the federal government and, intervention in any other matter that may be necessary to achieve the purpose of the Needs Assessment”. This mandate stem from the observations earlier carried out and it was noted that various countries fund tertiary institutions through varying approaches, some through budgetary allocations, non-budgetary interventions or private sector donations. While noting that Nigeria was involved in the tripod-like methods of funding mentioned above, as besides the Federal Government, the central Bank of Nigeria, Nigeria National Petroleum Cooperation(NNPC), Niger Delta Development Commission (NDDC), Tertiary Education Trust Fund (TETFund) among others. It would be recalled that the Federal Government set up the Need Assessment Committee to revitalise the physical infrastructure in the universities, with the aim of enhancing the Internally Generated Revenue (IGR) base of the universities. “With the expanded IGR, the universities council will be enabled to take care of staff earned-allowances and administrative needs of the universities on sustainable basis”, Anyim said. Other members of the Committee are the acting Executive Secretary of TETFUND as the Vice Chairman, a representative each of the Senate and House of Representative Committee on Education, the Office of the SGF, Academic Staff Union of Universities, Ministry of Finance, the Ministers of Education and Labour and productivity. Also in the committee are representatives of National Universities Commission NUC, SSANU, NAATS, CBN, NITDA, NCC, NNPC, PTDF and a representative of TETFund, who would serve as the Secretary.